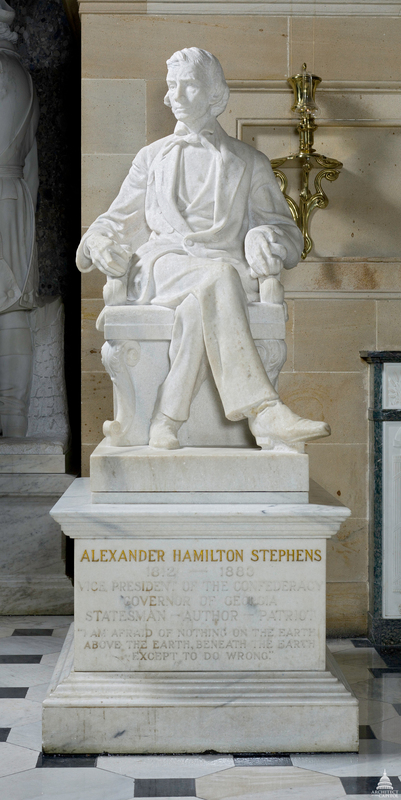 This statue of Alexander Hamilton Stephens was given to the National Statuary Hall Collection by Georgia in 1927. Stephens was a dedicated statesman, an effective leader and a powerful orator. Alexander Hamilton Stephens was born near Crawfordville, Taliaferro County, Georgia, on February 11, 1812. Left orphaned and penniless at age 15, he attended school through the charity of friends and by working. In 1832 he graduated from the University of Georgia. He studied law and was admitted to the bar in 1834. He served in the state legislature from 1836 to 1842 and in the U.S. House of Representatives from 1843 to 1858. Always in frail health, Stephens was nonetheless a dedicated statesman, an effective leader, and a powerful orator, always seeking moderation and peace. Abraham Lincoln, serving in Congress with Stephens, admired and befriended him; John Quincy Adams wrote a poem in his honor. Although opposed to secession and differing with Jefferson Davis over states' rights and nullification, Stephens served as the Confederacy's vice president. Lincoln's trust in Stephens led to the Hampton Roads Peace Conference, which was unsuccessful. At the close of the war, Stephens was arrested and imprisoned for five months at Fort Warren in Boston Harbor. Elected to the U.S. Senate upon his release, he was refused a seat because Georgia had not been readmitted to the Union. He served again in the House of Representatives from 1873 to 1882. Elected governor of Georgia in 1882, he served for four months until his death on March 4, 1883. Throughout his life Stephens helped numerous deserving young men secure an education, and he was influential in the affairs of the Wesleyan, the first state chartered female college. Stephens is buried on his estate, "Liberty Hall," near Crawfordville, Georgia.